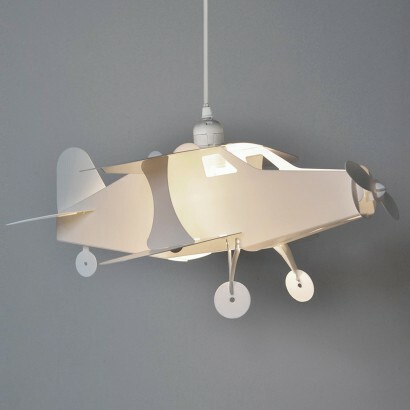 A cool white pendant shade that would be at home in any adventurous young boys room, the Aeroplane pendant features landing gear wheels and a front propeller. Suitable for use with a 60W bulb, this cute aeroplane is lit from the central body casting light out throughout the plane and illuminating it's features whilst casting a warm glow into your child's room. The perfect finishing touch for kids rooms, the easy to install pendant will fit any colour scheme. A great light and my 4 year old is very excited by it! Very sturdy design so does take a bit of strength to make. Definitely would recommend.